Pea purée is a great accompaniment to many dishes - and it’s very easy to make. The short season of fresh peas, from the beginning of June to end of July, is an ideal time to whip up some pea purée. However, frozen peas are available to use year-round, and are actually much easier to use. If using fresh peas, buy them just before you make the purée, as the sugars are quickly lost after harvest. Finally, cool the pea purée as quickly as possible - this will prevent the colour fading. Depending on the desired thickness and flavour of the purée, the amount and type of liquid used will vary. 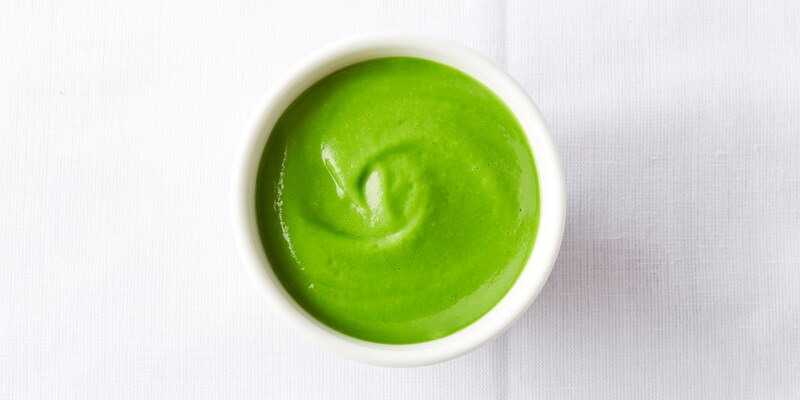 Nathan Outlaw adds no additional liquid to his pea purée, resulting in an intensely pea-flavoured, thicker result, while Galton Blackiston adds butter to his recipe for a rich and glossy finish. Peas can be cooked in different liquids, from milk to chicken stock. Additional ingredients such as mint, shallot and garlic can also be added to pea purée, just make sure the flavours are complimentary. Its sweet, fresh flavour makes it the perfect accompaniment to fish and shellfish dishes - Chris Horridge’s Scallop, pea puree, shoots and cumin foam and Martin Wishart’s Smoked haddock croquettes with pea puree, for example. It can also be used to fold through pasta dishes or risottos.